We have already had some blustery days here in Philly. This time last year it was actually snowing (one of our only storms of the season which was odd). I have been slowly gathering winter gear for me and the little guy. The biggest thing about biking in winter is layering! My most likely body part to get cold are my hands. I highly recommend wool glove/mitten things. I find them so warm in the wind but easy to move in. The other is my face a warm scarf is good for keeping your face warm. Otherwise basic layers like long johns are great for winter, I also like a fleece under coat layer and a wind/weather proof over coat layer. For little guy moving him to the backseat should help cut down on direct wind. But no doubt the little ones can get cold. 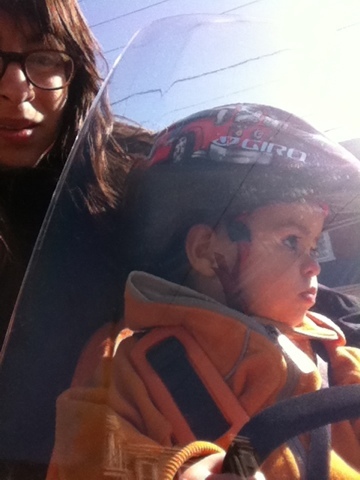 I'm intending to use my stroller snuggle me on his bike seat as the outer most layer of warmth. I've seen family ride use a snuggy for her little guy. Next up I purchased some snow pants that are fleece lined at REI on clearance for 12 bucks! These slip Over pants too so if our destination os warm he will not over heat. For lighter needs we have our rain pants. For upper body his shell we have Polarn O Pyret is a great coat lasting use two years! And like mama he has a fleece jacket inner layer. Little guy also has an array of fleece hats for under his helmet. Fleece hats are great for warmth but not bulk. Finally he can keep his hands inside the snuggle me but they'll also be in wool mittens! So that's are winter clothing stock for now. I'll keep you guys updated when November hits! PS I got my tracking number for my Yepp Maxi. Cannot get here soon enough. PPS Here we are biking last February we originally had the Yepp windscreen which is great for wind protection in the mini. But it isn't useable with the adaptor for the Halsted so we returned it.